Everyone who visits Little India inevitably has their favourite place to eat. Mine happens to be a chain. Yes, a chain. Udupi Palace has locations in Maryland, Illinois, Seattle, Queens and Mountain View, California to name but a few. 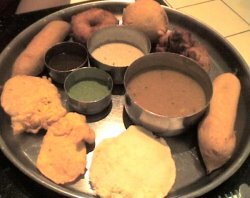 All focus on South Indian vegetarian food, and all are located in areas with a concentrated Southeast Asian population. The Toronto location, smack in the middle of the Gerrard India Bazaar, is a basement space that disconcertingly resembles a banquet hall. Tile floors, granite tables, and trompe l’oeil paintings on the wall combine to make the space feel somewhat cold and stark. It’s freakishly clean to the point of being almost clinical, and while it doesn’t actually smell of bleach, I always have the impression that the whole place is “sanitized for your protection” every evening at closing. None of that actually matters though, because no one comes here for the ambience. At Udupi Palace, it’s all about the food, and it’s the food that continues to pack people in. As soon as we’re seated, a battalion of servers in matching shirts goes to work (there are probably two servers for every customer), pouring water into goblets – which are never EVER allowed to be empty – and taking our order. Within minutes, mango juice and mango lassies ($2.95 each) appear at our table, quickly followed by the hefty assorted hors d’ouevres platter ($7.95) containing iddly (steamed rice and lentil patties), bhaji (sliced potatoes breaded and deep fried), special bondo (lentil dumpling with onion and potato) medhu vada (fried lentil donuts) chili pakora (deep-fried, breaded whole Indian chili pepper) and onion pakora. All of these are perfectly crisp (well, except the iddly which is steamed and fluffy) and lucky for me, the husband wimps out and I score both of the chili pakoras, a blast of heat tempered by both the breading and the accompanying sambar and coconut chutney. Next up is a dish from the new menu, the Iddly Manchurian ($4.95), in which the steamed iddly are cut into quarters and fried and served in a sauce that appears to be primarily comprised of garlic. This is absolutely awesome. 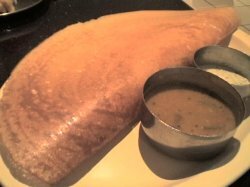 Those red-shirted servers whisk past us in waves, one carrying what we jokingly refer to as “the party dosa” but which appears on the menu as a paper dosa ($6.95) – this is a massive rice and lentil crepe, cooked crispy. It is about two and a half feet long. Overwhelmed at the prospect of eating an entire paper dosa ourselves, we opt for some smaller versions instead. The husband orders a basic masala dosa ($5.95) and is disappointed at the lack of spiciness in the onion and potato filling until he remembers that he normally gets the Mysore Masala Dosa (also $5.95) which carries a lot more kick, topped with a hefty serving of spicy chutney. 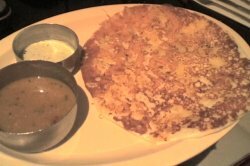 I opt for a Pineapple Uthappam ($5.95), which is also made from lentils and rice, but is cooked to a thicker, fluffier, pancake-like texture with the garnish cooked into the pancake instead of served on top. I totally dig the flavour combination of the pineapple in the pancake paired with the coconut chutney. At this point we are always full, although a Udupi server once told us that the dosa and uthappam are actually meant to be a first course, to be followed by a curry or thali. 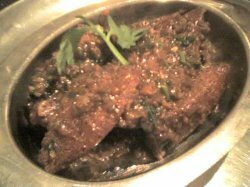 For those with a stronger constitution, or perhaps a hollow leg, Udupi Palace offers curries and thalis (all $8.95) served with rice and bread. We never have room for sweets and tend to opt to walk off some of our lunch by heading down the street for paan and burfi to take home, but Udupi Palace also offers a selection of desserts including halwa, ice cream and gulab jamun. Although the website does not reflect their recently updated menu, there is also now a kids menu with smaller versions of some dishes as well as items like sweet uthappam with jam. Udupi Palace is my favourite place in the city for dosa and uthappam. While some may find the service overbearing, it is always polite, professional and efficient, and for fans of vegetarian South Indian cuisine, it’s definitely worth a visit. What Do You Want… A Cookie?